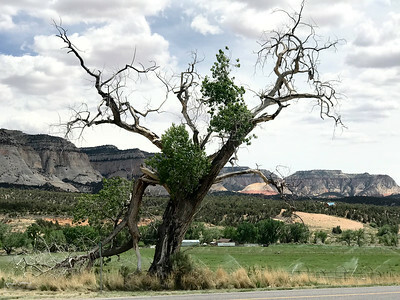 In May of 2018 together with Bernd Geh and Guy Ben-Zvi, we toured the Southwest. 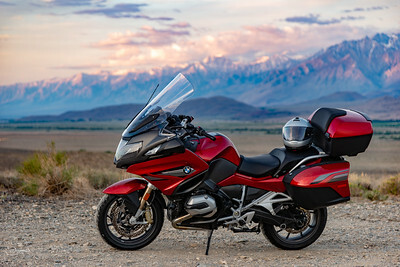 Three guys, their motorcycles, and "The Best Earth on Show"
Crossing over Sonora Pass, I ascended into the realm of clouds. Like fingers, they grasped the landscape, trying to stop the wind from blowing them away. After I said goodbye to my old horse - she was badly hurt after being hit by a car - I fell in love with this beauty. The Mars Red fits her temperament well. 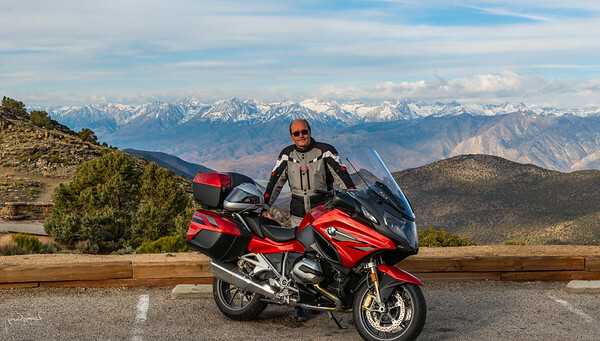 Early morning in the Owens Valley with Mt. Whitney in the background. 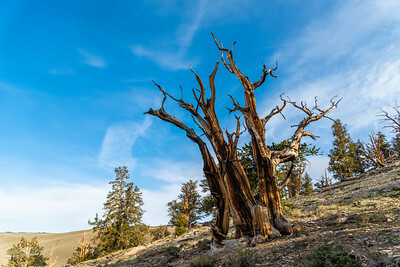 Along the road to the Ancient Bristlecone Pine Forest, there is an outcrop called Sierra View. I arrived early, just as the sun started to kiss the world below. 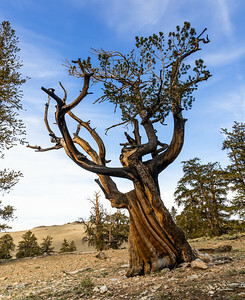 Dawn in the Bristlecone Pine Forest is magic. 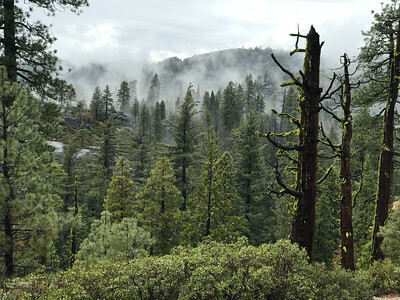 The light is soft, the air is cold and crisp, the trees welcome yet another day, stretching out their branches as if reaching for the warmth of the sun, just like they have been doing every morning for the past 4000+ years. 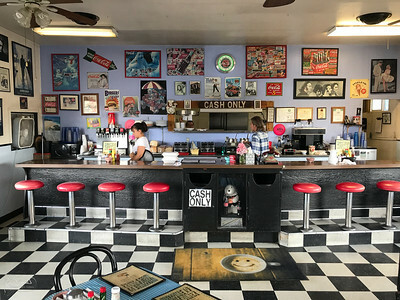 Somewhere along Route 95, tucked away in an old light-blue building, is Mel's Diner. Straight from the '50s, it is like stepping into a time machine. Next thing you know, the King could walk in with his blue suede shoes. Riding along the North Shore of Lake Mead, one can only wonder at the juxtaposition of water and sandstone. 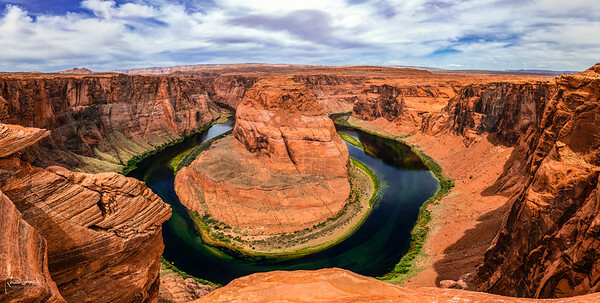 Yet these two elements are intricately linked as together they shape the landscape of the American Southwest. We stopped for coffee at this hip cafe in Springdale, UT, at the entrance to Zion NP. 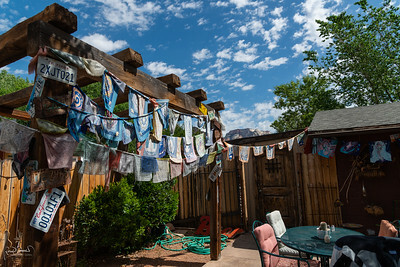 Doing justice to the spiritual energy that abounds here, the backside of the patio was adorned with prayer flags - and an occasional license plate. Geology as a living science. Lower layers of stone have developed vertical fractures as they rose to the surface and the expanded as the external pressure fell away. The top layers are more porous and respond differently. Being from the Netherlands, trees and clouds are an ancient theme in art, going back to the painters of the Golden Age. How stunned would they have been, had they had the opportunity to travel the Southwest. 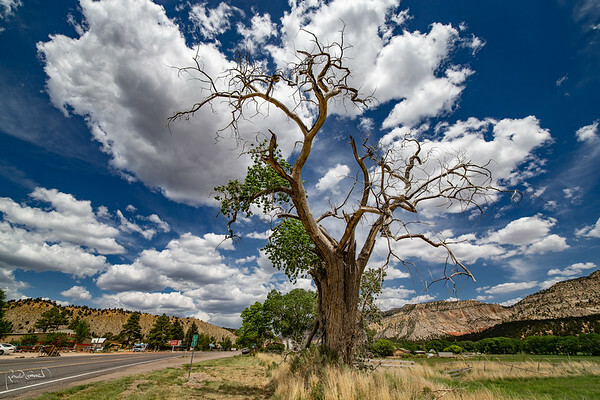 The winds from the Colorado plateau force themselves through an opening in the mountains. As wind speeds increase, they create a Venturi effect that picks up the sand grains. As the landscape widens and the wind speeds drop, so do the grains of sand, over time forming these "coral pink" sand dunes. 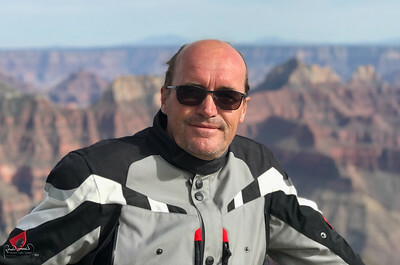 I have been lucky to have visited the Grand Canyon many times. Every time, she presents me with a different look., This time, she was quiet, in subdued red-brown hues, as if in a languid mood. We rode through the forested landscape on the north side of the Grand Canyon for two hours, through meadows, trees, softly rolling hills. 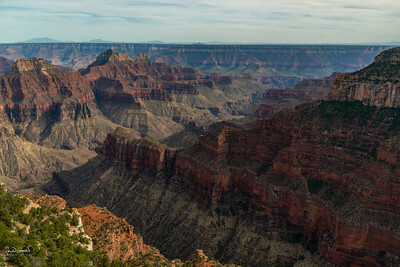 An then the Grand Canyon unfolds in front of your eyes. It deeply affects me every time. I belong in this landscape. 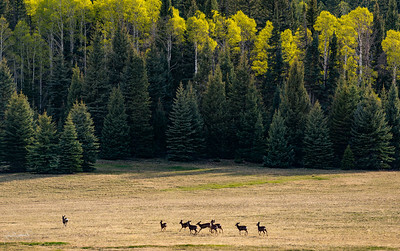 Riding through the forested areas north of the Grand Canyon, aspen trees are interspersed among the pines. In the evening sunlight, backlit, they become like torches of light, screaming "look here, look how pretty we are". The deer were grazing on the meadow, getting their last bites in before the cold of the night. Quiet time in the forest, yet they remain vigilant. A strange sound - someone is flying a drone - one deer decides to dash away and the rest follows. Spring brings exuberance to the forest. 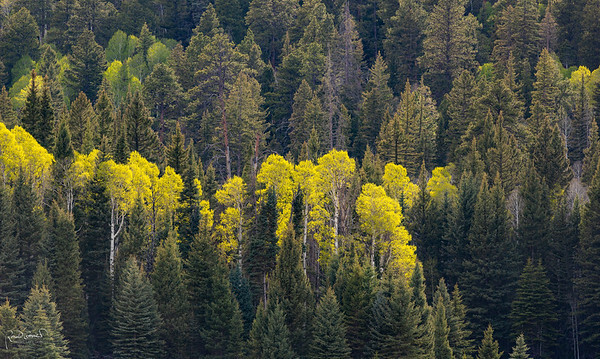 Some aspen have managed to grab a warm spot and they come alive quickly, others are still dressed in their winter outfit. 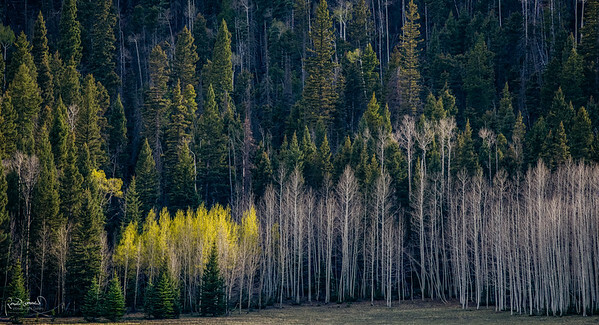 The pines quietly look on while the aspen, the play the role of the bass in this natural symphony, leaving the role of the bright brass section to the aspen. 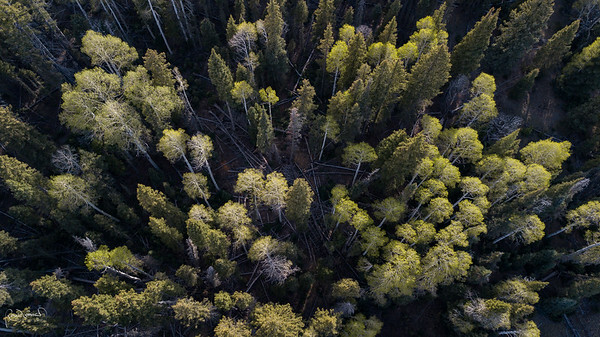 Drones are radically changing what we can do with landscape photography. They offer a completely different view of nature. They makes us long to grow wings so that we can fly like birds. 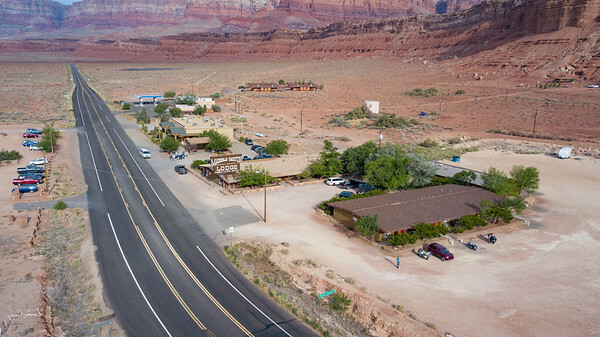 After having spent the evening hours near the Grand Canyon rim, we rode through the dark until we checked into the Marble Canyon Lodge. 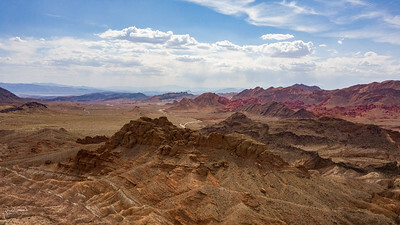 Next morning, Bernd's drone offered us a unique vantage point to appreciate the Vermillion Cliffs. 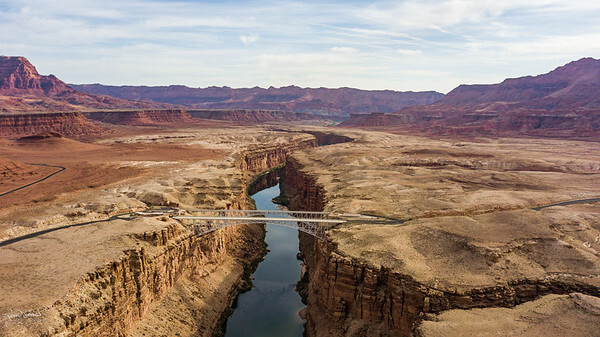 At Marble Canyon, the road crosses the Colorado River. Bernd's drone is called into action to show the grandeur of the surroundings. 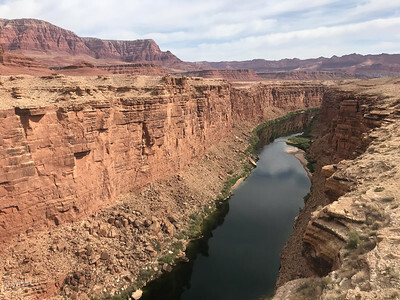 From its vantage point, one can truly appreciate how the Colorado River has shaped the landscape. 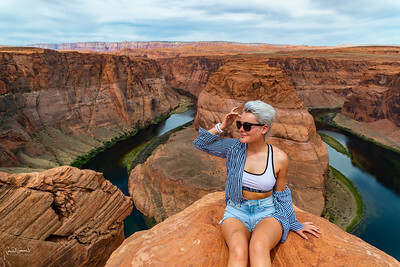 Many years ago, I first saw a photo of the Horseshoe Bend. Since, I have longed to see this with my own eyes. Even though it has become a massive tourist attraction and I am concerned about the future integrity of the site, the scenery still gave me goosebumps. 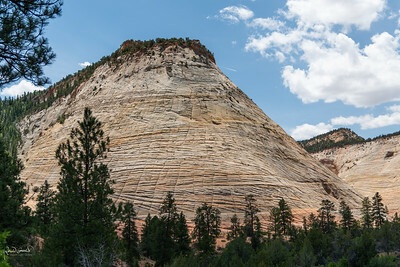 This panorama made of > 30 individual images will soon be turned into a metal print for my office. Her name is Kristine. She asked whether I would take her picture as she was looking at the water. As soon as I said yes, she swiveled around and fell into her pose. She knew exactly what she wanted. She was very happy with the outcome. 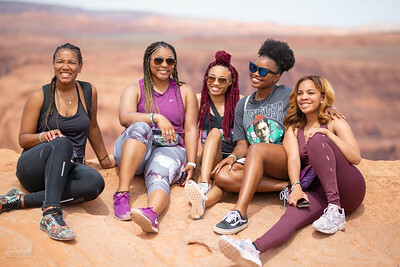 Love the pride, joy, playfulness, and individuality that this group of young ladies radiated. Nice personalities.